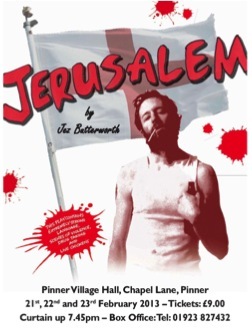 "This multi-award winning play Jerusalem is already considered a modern classic. It only recently completed its professional run so we felt privileged to stage it. Jerusalem is a wonderful piece of theatre, which is thought provoking, moving, disturbing and hilariously funny all at the same time. The play is set just outside the West Country village of Flintock in a clearing in the woods outside a caravan occupied by the play's central protagonist and local waster, Johnny "Rooster" Byron. Having lived there for 30 years and having repelled all attempts to evict him, Johnny attracts local youngsters who are drawn to his personality ... and his supply of drugs and alcohol. The play is set on St George’s Day which is also the day Byron is finally set to be evicted. Council officials want to serve him an eviction notice, his son wants his dad to take him to the fair, a stepfather wants his daughter back and a motley crew of mates want to get drunk and high on his ample supply of drugs and alcohol." 'All Byron boys are born with teeth. Thirty-two chompers. And hair on them's chest. No wailing and weeping. Talkin' straight off ... "